﻿ Pankaj kungfu review at China kunyu shaolin kung fu academy China. Three months course from Aug to October 2016. China is a wonderful country and I wanted to experience traditional Chinese Kungfu while enjoying the countryside and picturesque landscape that the country has to offer. I increased my endurance, strength and flexibility a great deal in these 3 months that I practiced Shaolin Kungfu. I also experienced good self- awareness now, with the practice of meditation and Qi-gong. I was in Master’s Meng’s group and he helped me a great deal in my training. Also, all the students were very helpful in providing supports and encouragement during the training. Life in the academy is pleasant, disciplined and it provides an environment for hard work and focus. Training is tough but rewarding at the same time. Masters are helpful and very knowledgeable. Students are also focused and supporting of mew team members. Translators are good too. Surroundings of the academy is very beautiful, very natural and positive beauty, provides a quiet and peaceful way of life. 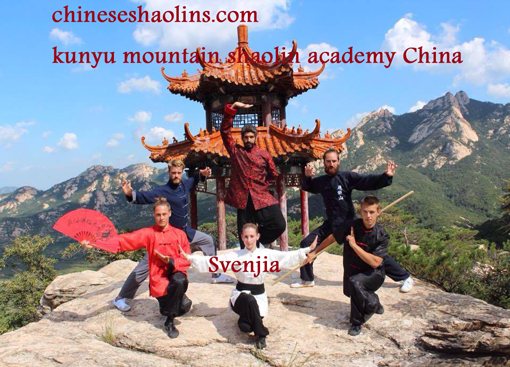 Shaolin groups at Kunyu mountain . I wanted to learn the basics of Chinese Kungfu, which I can continue in China Kunyu mountain academy afterward in my country.In kunyu academy,I learned a lot about my body and feel confident to continue Kungfu or daily workouts. The international students and Bella have very good influence to me.I got very good training, Shifu Sun was very helpful and trained us well,and the location of academy are very nice.